T-ZINE MEDIA’s powerful collection of brands and passion-based communities provide simple and accountable ways for the world’s top brands to engage today’s social consumers and passionate niche audiences through rich content experiences. Our publishing platform is designed to allow marketers to create ads that take full advantage of the mobile-tech tablet functionality. Each ad will be its own standalone app, making ads more entertaining, more informative, and more engaging and capable of generating direct sales with a single tap of a button, dispensing coupons and digital collateral capable of being stored on a reader’s home-page app library, where the ad can live on indefinitely. It connects readers with marketer’s products and services in an innovative way. Our advertising model takes an entirely new approach. It’s structured to give marketers the opportunity to implement marketing programs and solutions, rather than simply buy page of space. It addresses a fundamental need in the industry: an all-new advertising format for an all-new advertising platform. Custom-built ads, with limitless feature options, including sharing, maps, games and more, are designed for engagement. 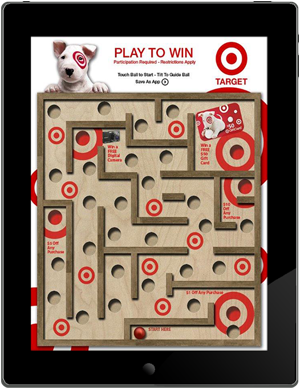 This simulated Target ad engages readers with a game where they can earn a “gift card” coupon to drive foot traffic to the nearest Target location. This simulated ad becomes even more compelling and valuable when users save it to their library, allowing Target to maintain their customer base and prompt on-going usage with the option of changing the game or re-skinning the ad to reflect the season. 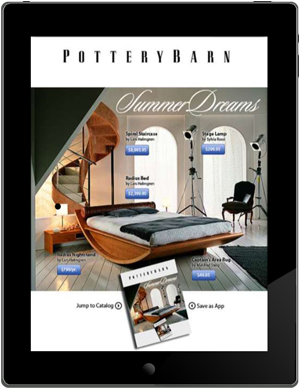 This simulated Pottery Barn ad was developed as an example to show how one-touch purchases can be made through the capabilities of the T-ZINE MEDIA e-commerce platform. Pricing can be viewed and items from this Pottery Barn catalog can be purchased immediately by simply clicking the blue button. This unique advertising solution offers marketers an entirely new world of mobile-tech enabled advertising, complete with one-touch transactions tied to each of the T-ZINE MEDIA member’s credit card-anchored account. T-Zine’s e-commerce platform is designed to excite members and prompt them to interact with one-touch purchases from any ad placed in our digital publications. Every ad is capable of generating direct sales with a single tap of a button. Coupons can be displayed and digital collateral can be stored at our member’s home-page app library, where the ad can live on indefinitely. This Quiznos ad example shows how marketers can produce ads that incorporate GPS and real-time mapping to create a powerful couponing strategy. Readers can find the nearest Quiznos location from anywhere and apply coupons that can be updated on the fly to support various promotions. 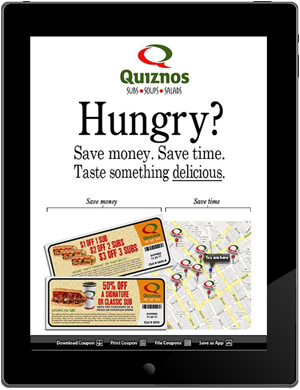 The ad can be saved to the user’s home screen as well, reminding readers to eat at the nearest Quiznos every day, and assuring them of having the most recent set of coupons on hand. Marketers can engage T-ZINE MEDIA readers with rich brand ads that are relevant to consumers’ unique tastes.